Many of Southeast Asia’s major cities still rely heavily on groundwater to supply their growing populations and business districts as people flock to urban centers and industrialization marches on. Vast sections of Southeast Asia’s cities could sink below sea level in the coming decades as residents draw up groundwater faster than it can be replenished, leaving governments scrambling to prevent flooding on a massive scale. The Indonesian capital of Jakarta grapples with some of the severest land subsidence in the world. Flooding in Jakarta occurs on the northwest coast of Java, at the mouth of the Ciliwung River on Jakarta Bay, which is an inlet of the Java Sea and has happened recently in 1996, 2002, 2007 and 2013. Land in the city sank around 200cm on average between 1900 and 2013, according to Dutch research organization Deltares. The problem is even worse in the city’s northern section, which abuts the ocean. Some 40% of the city is already at or below sea level, in the so-called zero-meter zone. Jakarta’s plunge has picked up pace in recent years. Land is expected to sink another 180cm on average by 2025. North Jakarta could be in danger of inundation by then unless something is done, according to such bodies as the World Bank. A Rolls Royce is stranded in floodwater in Jakarta’s central business district. The floods were the most widespread to hit Jakarta in recent memory. Authorities said at least four people were killed and 20,000 evacuated. Few areas in the city were spared, from wealthy suburbs to riverside slums and gleaming downtown business blocks. Doing nothing would force some 4.5 million people — nearly half of the city’s population — to leave their homes by 2020 over the encroaching ocean or the spread of infectious disease, estimates the National Development Planning Agency. The value of lost land could come to $103 billion. In response, the national and local governments have planned a massive seawall, roughly 16 meters high and 35km long, on the shores of Jakarta Bay. But Anies Baswedan, Indonesia’s former education minister and Jakarta’s governor-elect, has hinted that he could reassess the plan upon taking office in October, citing the impact on fisheries. The cost of the wall and associated landfill projects, said to be as high as $40 billion, is also a source of lingering discontent within the government. With construction expected to take at least seven years or so, officials may be running out of time to make the final call. Cities around the world deal with subsidence to some degree when groundwater is pumped out and land sinks to take its place. Industrial customers are particularly drawn to cheap subterranean sources. Tokyo settled as much as 20cm a year back in the 1950s and ’60s. This abated after the city introduced water restrictions and built new sources for household and industrial water in the ’60s. But once land sinks, the damage is done. Jakarta is a coastal city with as many as 13 rivers, which often burst their banks during the rainy season causing massive flooding in the densely populated communities. 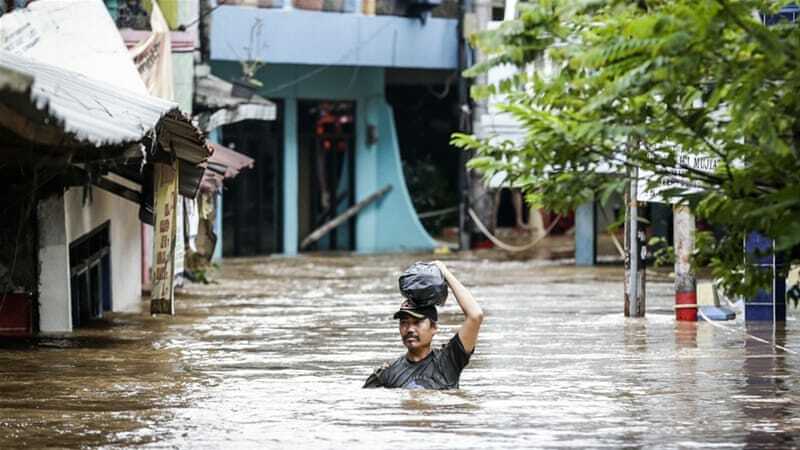 The capital is hit by flooding to some degree every year during tropical Indonesia’s months-long rainy season, with the city’s numerous riverside communities worst affected. The downsides are increasingly apparent. Massive floods occur with alarming frequency, compounded by severe weather such as heavy rains, thought linked to climate change. Jakarta’s government and economic functions ground to a halt in 2013, when heavy floods swept the city center, including the grounds of the presidential palace. Sustained flooding in Thailand in 2011 severed supply chains, with severe consequences for business. The damage will only grow more severe as cities sink further, particularly once they fall past sea level. Waterlogged land will become unusable, and salt damage from seawater could deal a stiff blow to the agricultural sector. Intrusion of seawater into Vietnam’s Mekong Delta, one of the world’s premier rice-growing regions, has already begun to affect production of that staple grain. Emerging countries lack the cash to match explosive urban growth with infrastructure development and other safeguards against subsidence right away. Bangkok is taking steps to replenish groundwater reserves, but these will not be enough to stop the sinking entirely. The international community has begun taking note of potential impacts on the world economy. The Netherlands set up in 2016 the Delta Coalition, a research organization involving 12 countries including Japan. The group will hold ministerial talks in Bangladesh this July. The Netherlands has coexisted with water for 2,000 years, as has Japan, said Henk Ovink, the Dutch special envoy for international water affairs. They must now teach emerging nations how to do the same. Nikkei staff writer Tomoyo Ogawa in Tokyo contributed to this report. Previous articleApakah kamu seorang Sapiosexual?